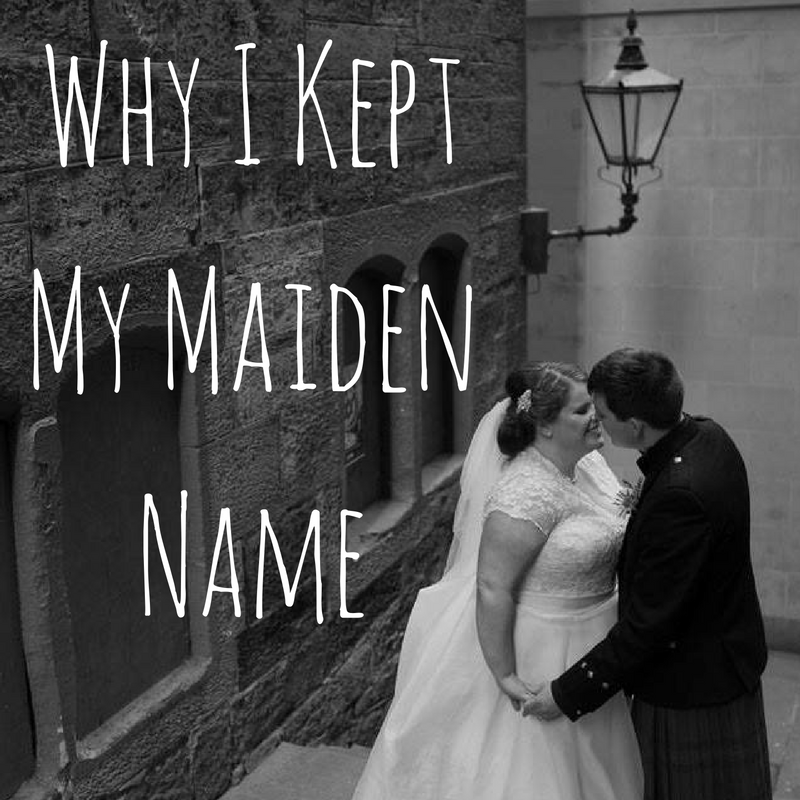 Why I Kept My Maiden Name. I'll straight up admit it: even before I'd started dating Blair, I was practising my signature with his last name (he's going to think I'm the biggest creep ever when he sees that). 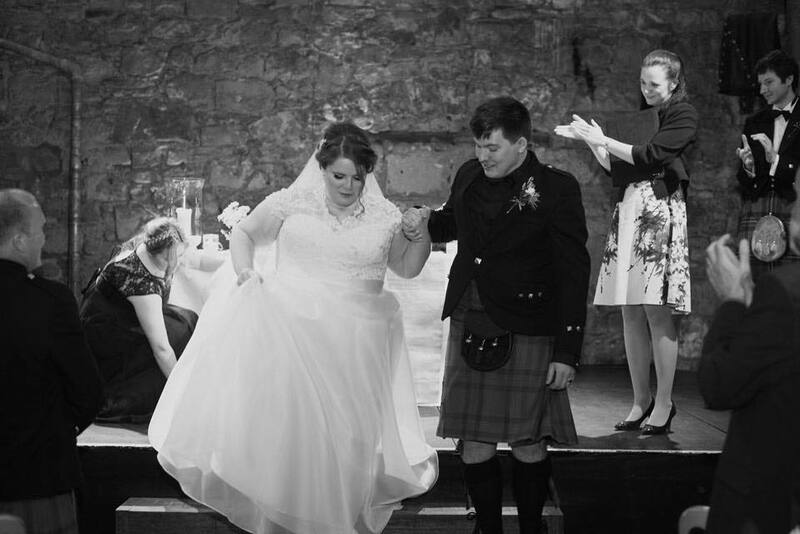 However, when we did marry in May 2015, I'd decided to stick with my own surname - even though most people assumed I wouldn't. I hadn't realised that in this day and age I'd still be expected to explain my reasons for this, but I was, and still am. While Blair and I had discussed this beforehand and were both completely fine with my decision, I was much more nervous about telling the rest of his family. I think they are perhaps a little more traditional than my own very blended family, and I was worried that it'd be seen as an insult or a rejection. 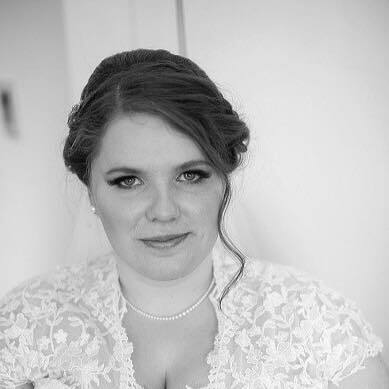 My sister-in-law had done the whole Kim Kardashian West thing and double barrelled her surname when she married into the family, and this was frequently suggested to me too, which I found even harder to say no to - surely that's just refusing to compromise?! But I had a few reasons for this, and so I kept my own last name. Obviously, there are feminist implications. I find this quite hard to articulate. I consider myself a feminist, and therefore I can definitely see the argument that having to change your name from that of your father to your husband to show who 'owns' you is troubling. However, as I'm sure many people will point out, there are a lot of fairly sexist things about marriage (even though I've used it, I hate the term 'maiden name') so why do it at all? For me, my father 'giving me away' was actually more 'helping me down the aisle in shoes I couldn't walk in while I was on the brink of a massive panic attack cause everyone was looking at me'. I didn't throw a bouquet because dammit those were my flowers and I don't know a single woman who needs marriage to 'complete them'. 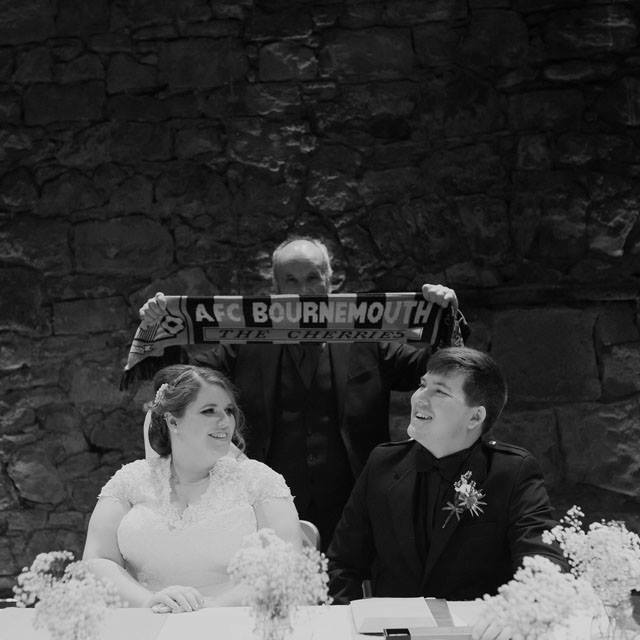 We had a woman officiate our wedding, and a woman taking the photos. However, we also did the traditional speeches, but our top tables consisted of our closest friends. Basically, we picked and chose what worked for us. I want to make it really clear: I don't think that you 'can't be a feminist' if you throw a bouquet, or get walked down the aisle by your dad, or take your husband's name. Of course you can. Feminism is about equality and choice, and whatever works for you is the best. For me, keeping my name was the best decision. It's all personal! Marriage shouldn't mean losing your identity. I guess this ties in with the feminism point: I didn't really see why getting married to someone meant that I had to change who I was. He fell in love with me as Beth Woods, so why did I now have to change that to (hopefully) spend my life with him? The idea of not having the same name I'd had for 25 years was really intimidating for me. Being able to tie up all the things that made me, me and call that little bundle of oddness 'Bethany Jane Woods' was oddly reassuring to me. Maybe it's different for you, but for me, I felt like changing my name was somehow changing my identity. My life didn't begin with Blair. This was a big point for me, that ties in with losing my identity. I felt like changing my name was in some way erasing the 19 years of life I'd had before Blair was a major part of it, or the 25 years before I became 'his property' (I'm kidding, if I was his property he'd have traded me in for a better model by now). I love him very much, and I'd like our lives to be intertwined for the foreseeable future, but him being my husband is not the same thing as him being the be-all and end-all of who I am. Yes, we've made vows I fully intend on keeping (who knows what he's up to with all those beautiful Norwegians right now) but if the worst happens and he walks away, then I'm still me. I like to think of it like this, if my whole life was written out as a book marriage is just part of the plot, not the entire narrative. Reducing my entire identity down to who I sleep with is a really weird concept. My family are extremely important to me. Honestly, he wouldn't do it for me. This might come across as a little petty, but it's honestly not. Before we married we discussed this whole thing openly, and I asked if he would change his name to mine. He said he wouldn't, that he probably wouldn't even go double barrelled or one of those 'combination' names where you merge them into a new word. I wouldn't ever have expected him too though - maybe that's social norms kicking into play but I also think every point I've made could apply to him too. But if he wasn't expected to do it, if he had outright dismissed it, why would I do it?! Equality in relationships is important, and for me this was the final straw I needed to convince me I was making the right choice. Obviously this is a very personal decision to make, and my reasons may not apply to you. You may choose to take your significant other's name, and that is awesome! All I want is for this to be more of a choice, and something we don't think twice about. Having to defend this decision was uncomfortable and frustrating. It's up to us to decide what we feel is appropriate, and I'm so happy with the choice I made. What about you - would you change your name? Why, or why not? I'd love to hear your reasons! Snaps all around. I feel the same way. I'm not looking to get married for a while, but a lot of the things you covered are on my mind. Why should I have to change my name? What will my family think if I don't? etc. Love this post and I love that you voiced your opinion on this because you make great points! A very thought provoking post, personally I will be shedding my last name when I marry next year but then I just feel like it's the right thing to do for me. So I was just randomly scrolling back through your Blogtober posts and came across this one! (Does this make me a stalker or just a good friend? I'm hoping the latter...) I just have to say that you guys are the CUTEST COUPLE EVER and you look absolutely stunning in your wedding pics! And the way Blair looks at you is everything! I completely understand your reasoning for not taking his name, if I were to get married I would definitely keep my name! I used to absolutely hate my name when I was younger but now I feel like I've grown into it and I wouldn't change it for any man or for the world! What I've Learnt From Blogtober. 27 Thoughts on Being 27. Biggest Fears + Spooky Incidents. "So When Are You Having Kids?" Little Life Lessons I've Learnt From Drag Race. Cutting My Ties by Deleting My Emails. 5 Things They Should Teach In School. October Beauty Boxes - Birchbox vs Glossybox. Is Social Media Bad For Our Mental Health? My Mental Health Story - #WorldMentalHealthDay. Podcasts I Can't Stop Listening To. Mental Health Bloggers You Should Be Following. The Pros and Cons of Being a Rig Worker's Wife. Why It's Time I Took A Risk.